Kazakhstan might be best known for its nomadic roots, but its new capital city, Astana, is making waves with a surrealist skyline. When the government moved the capital to this small city on the northern steppe in 1997, it was essentially a tiny outpost. But nowadays, the skies here glitter with obscurely-tilted glass and wavy gold towers. The city has invited star architects like Norman Foster and Kisho Kurokawa to reinvent Astana's look, transforming the city into an urban landscape that makes you feel a little bit like you've travelled forward in time. 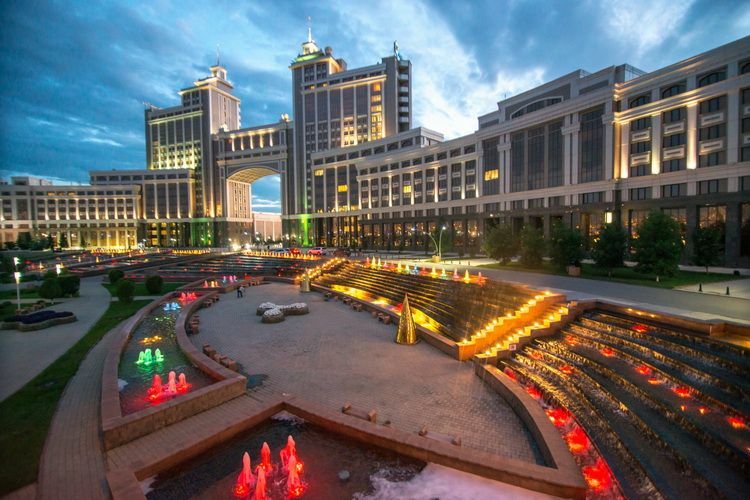 Catching a glimpse of Astana's zany and beautiful architecture is as easy as walking out of your hotel (or perhaps gazing up at it, depending on where you're staying). Better yet, hire a car or driver to get a grand tour of the city's buildings. Here are some of our favourites. This giant circus tent-looking structure is actually a huge shopping mall and entertainment centre. 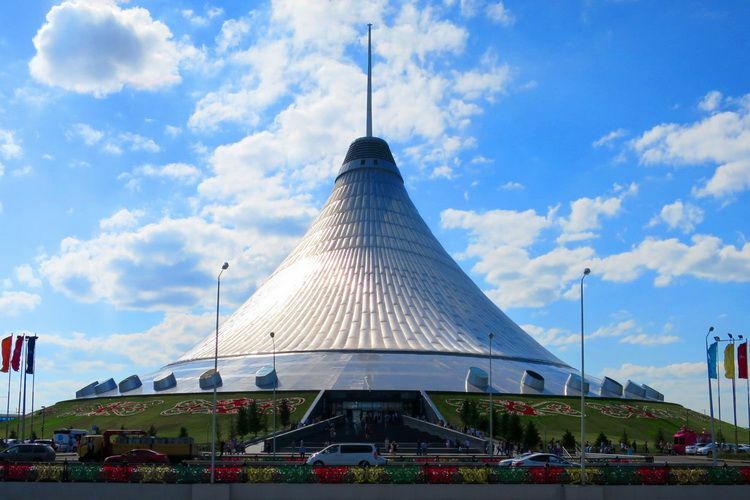 Designed by British star-chitect Norman Foster, the Khan Shatyr's quilted fabric roof keeps the interior temperature at a balmy 25-30°C year-round, which makes for pleasing conditions in which to enjoy the artificial beach, with sand imported from the Maldives. 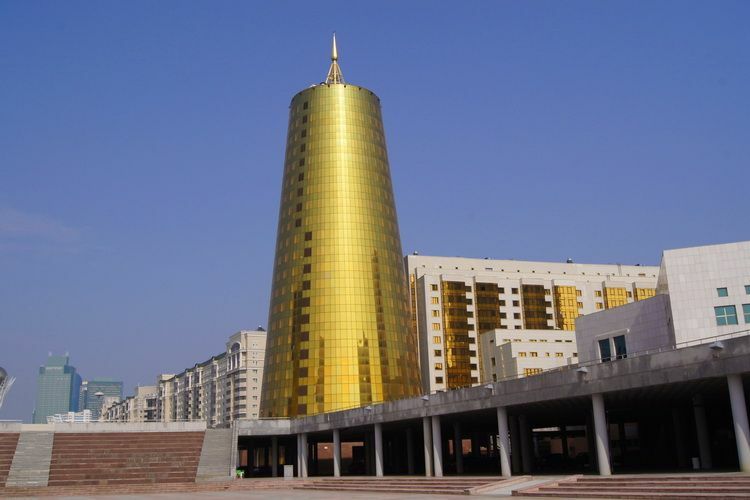 Two giant, golden glass towers flank the entrance to the Presidential Palace (Orynbor St) in true surrealist glory. For reasons not entirely unobvious, the locals have dubbed this golden pair the 'beer cans', perhaps undermining some of the shining glory they were meant to achieve when they were constructed just after Astana was crowned the capital in 1998. Local legend has it that Kazakhstan's president, Nursultan Nazarbayev, sketched the idea for Bayterek tower on a cocktail napkin. Whether or not this is true, the tower certainly is shrouded in legend: it's meant to symbolise a mythical egg in a mythical tree. 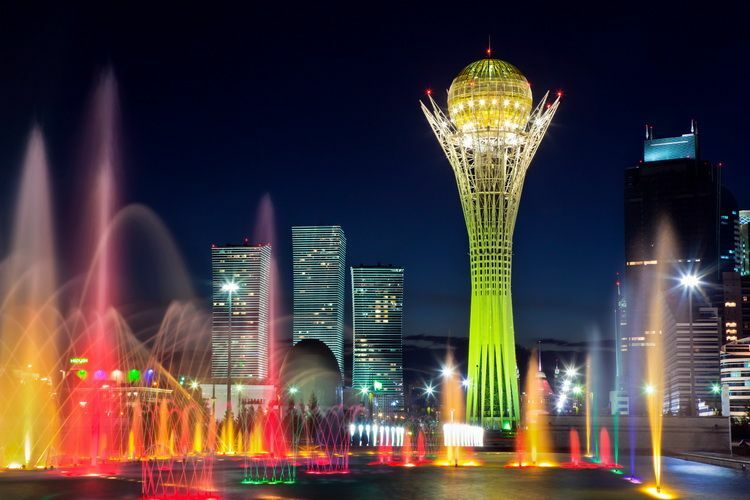 The tower has become the symbol of Astana and is a sight to behold – and indeed, it can be seen from almost everywhere you go in Astana. This 77-metre-high pyramid is another Norman Foster structure, designed to host the Congress of Leaders of World and Traditional Religions every three years. The interior chamber is a circular space based loosely on the design of the UN Security Council meeting room in New York. Looking slightly forlorn on a particularly open and flat patch of Astana's skyline, the pyramid is a surprising jut into the sky. 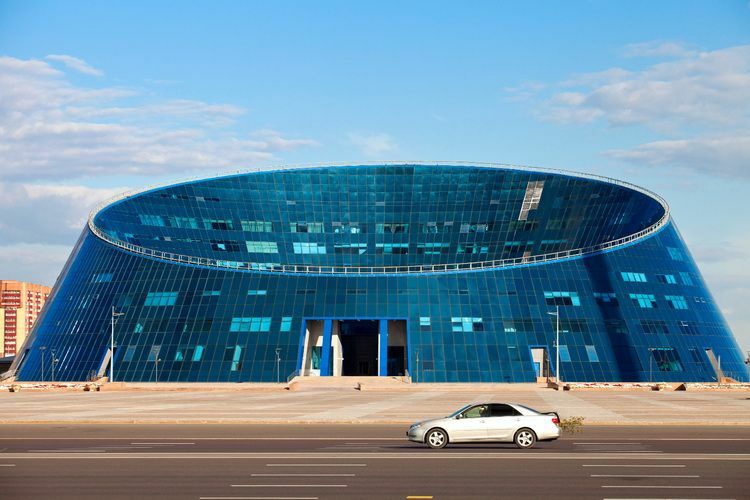 This gigantic concave glass structure houses Astana's catch all 'Palace of the Arts', which includes a school of fine arts, lecture and exhibition halls, performance spaces and a library. The Shabyt's shape has led some to call it the 'Dog Bowl'. If the aliens already walk among us, then they most certainly left their spaceship in Astana. 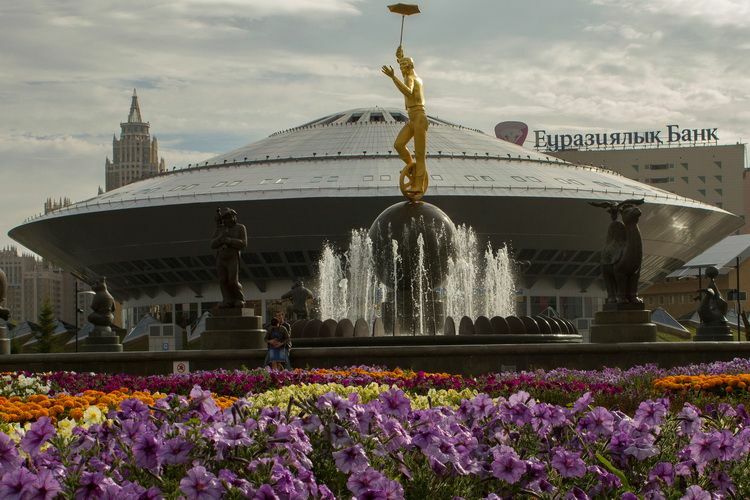 The Metropolitan Circus (Kabanbay Batyr 5) is housed in this enormous disc, giving the impression that a giant UFO simply dropped down in the middle of the city and stayed forever. 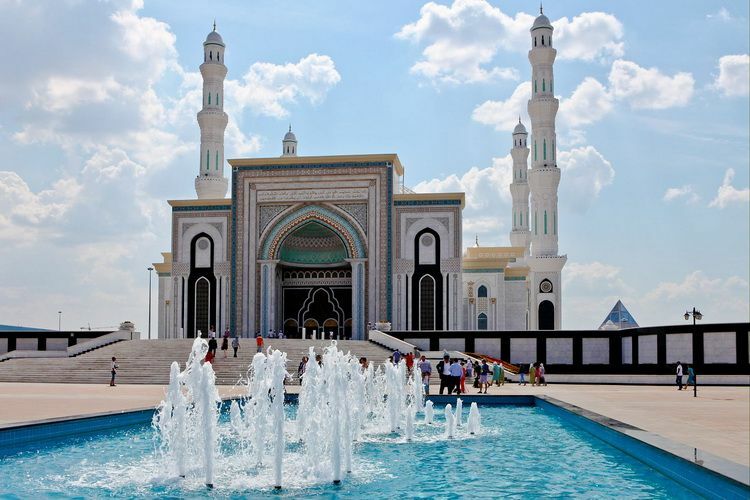 The largest mosque in Kazakhstan, the Hazrat Sultan Mosque (Tauelsizdik) regularly sees up to 10,000 worshippers. 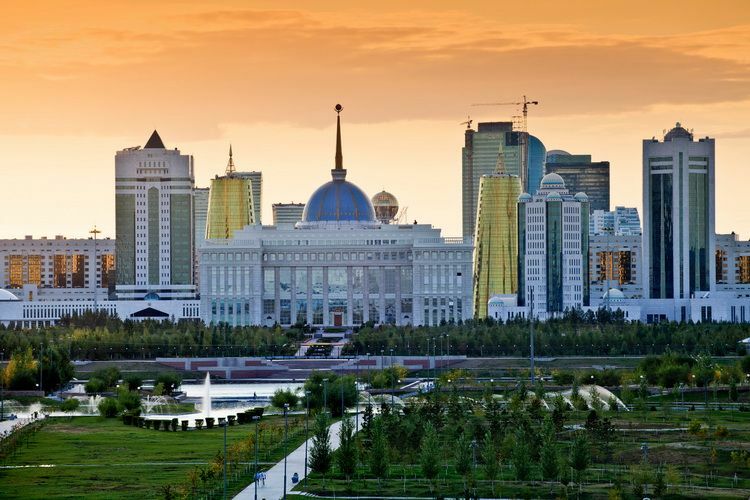 Its towering white turrets are visible from many parts of Astana, and the lavishly marbled interior halls and tiled domes are well worth a peek inside. Looking a bit like the headquarters of some New World Order, the Ak Orda presidential palace houses the offices of Kazakhstan's president (though not his residence). 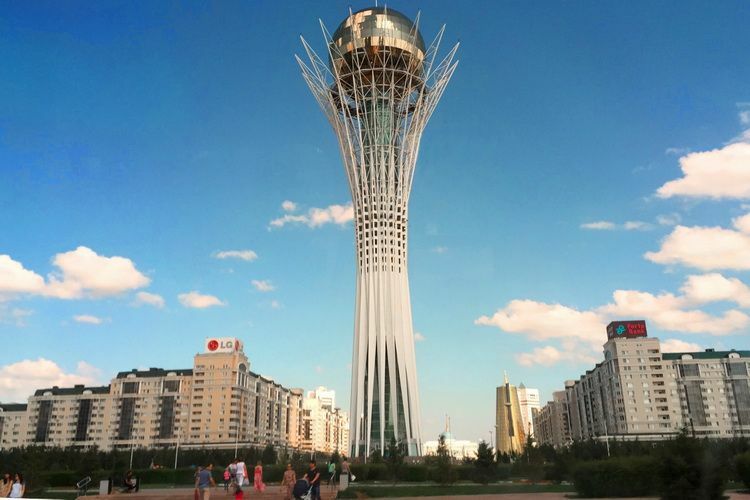 The small ball at the top of the spire represents the sun, with a Kazakh steppe eagle flying beneath. 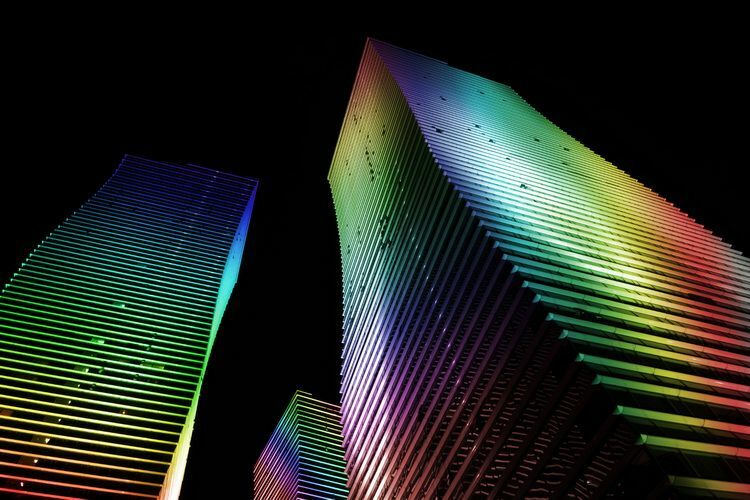 To fully appreciate this trio of curvaceous residential towers, you need to catch a glimpse under the dark of night, when their futuristic rainbows glow in a ripple of colours from top to bottom and back again. Hence the name. 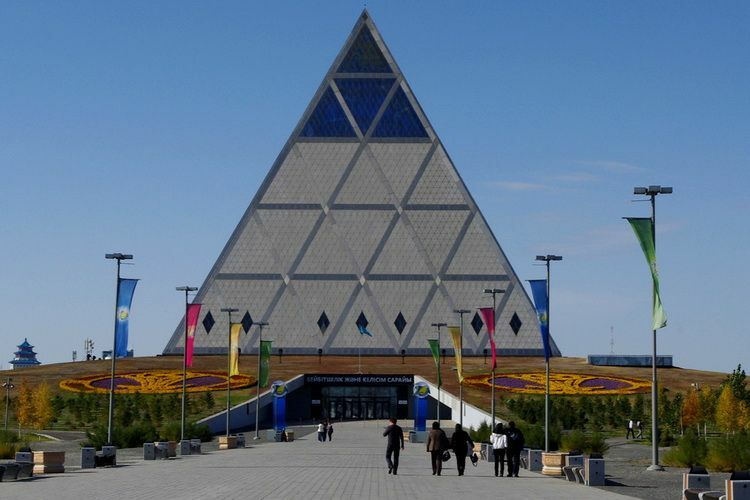 A large portion of Kazakhstan's economy is based on its extensive oil and gas reserves, so it stands to reason that the state energy company, KazMunayGas, would have as its headquarters (Kabanbay Batyr 19) a building as outlandish as this. Looking like either the newest casino on the Las Vegas Strip or a comic book villain's lair (or some combination of the two), this building is actually quite pretty at night when its numerous fountains are lit up in myriad colours. Why build any old velodrome when you can build one in the shape of a cycling helmet? 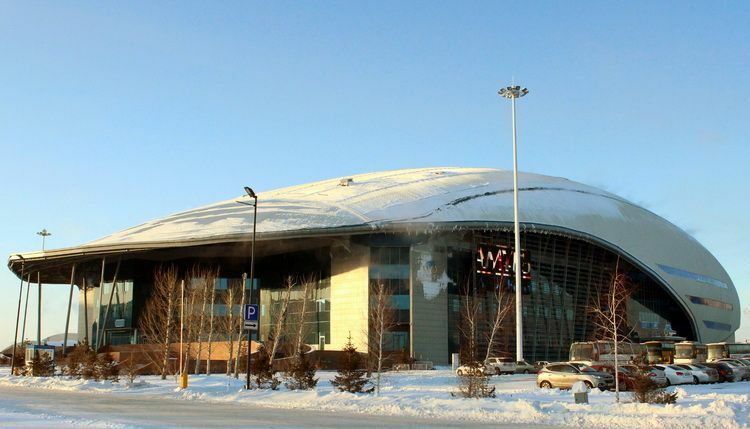 The Saryarka Velodrome (velotrek.kz) houses an indoor cycle-racing track, as well as other sports facilities, including a swimming pool, basketball courts and an ice rink. 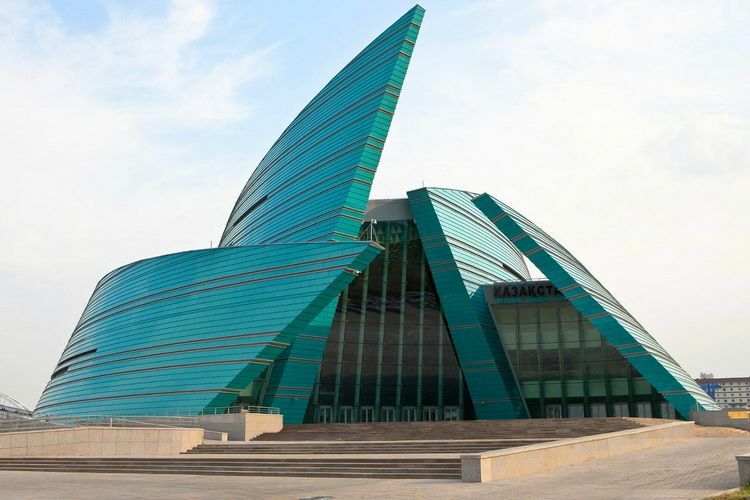 Designed by Italian firm Studio Nicoletti Associati, Kazakhstan's Central Concert Hall (ckzkazakhstan.kz) is shaped like the layered petals of a rose. Inside, three different concert auditoria host many of the country's biggest classical music and dance performances throughout the year. Megan travelled to Kazakhstan as a guest of Air Astana (airastana.com). Lonely Planet contributors do not accept freebies in exchange for positive coverage. When and what place would you like to visit? How many people do you plan to take?